This is a sketch which I made this evening. I didn't have any real plan when I started, I just wanted to draw... so I put a few curves down and built the picture up around it. 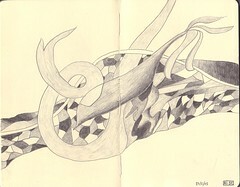 The image takes up a full double page in the moleskine, hence the central vertical line. I have no clue what it is supposed to be.... any ideas?